I woke up a couple of days ago to a whole bunch of "failure notice" emails in my inbox and a couple from friends kindly informing me that I'd been hacked. First of all, in case you aren't already aware, NEVER, NEVER, NEVER, click on a link in an email if you aren't ABSOLUTELY POSITIVE that the email was sent from someone you trust. And just coming from their email account doesn't cut it. Generally speaking, reputable people, friends of yours, won't send you an email with their name as the subject and with the only text being a random link. These are red flags, folks. Just don't do it. Secondly, it was actually helpful to weed out the emails in my contact list that were no longer active. So, thanks, hackers, for performing that service for me. Thirdly, I hope some hacker got a real kick out of hacking into an account with the password "ih8hackers!" And yes, I've changed my email account password. And several others now. It's probably a good idea for you to go do the same. 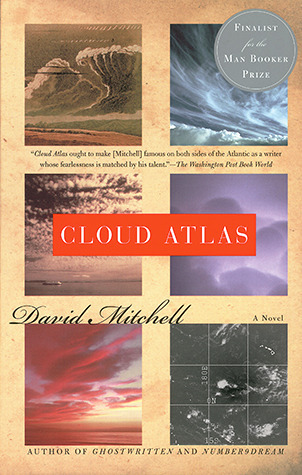 I just finished reading David Mitchell's Cloud Atlas and my mind is blown... I'll try to get a full review up in a few days, but it's one of those books I keep thinking about and coming back to and finding new connections days later. And I'm sure I've missed most of them. Just, wow. But the topic I really wanted to mention here is the use of dialect in novels. While each of the six stories in the novel has a distinctive voice and diction, some of them were much easier to read than others because of the way the author used language to establish the setting and characters. I particularly struggled with the last story (or central one, rather). It's set in the distant, post-apocalyptic future and the characters speak a kind of pidgin English, with lots of apostrophes and missing letters and slang terms ("babbit" for "baby", for example). Sometimes the language felt like a serious distraction from the story, and sometimes it felt far more authentic than "proper" English would have been. What are your thoughts on using dialect in stories? When is it effective for you and when is it just distracting? The Church (of Jesus Christ of Latter-day Saints) is putting out a new edition of the scriptures! This is the first one since 1979 (for the Bible) and 1981 (for the Book of Mormon, Doctrine & Covenants, and Pearl of Great Price). I'm especially thrilled about the updates to the Doctrine & Covenants that reflect the recent scholarship done through the Joseph Smith Papers Project. (If you haven't checked that out yet, you really should. Like, now.) Many of the section headings have been corrected or additional information has been added so they are more clear and accurate; punctuation and spellings have been updated, too (particularly in the Bible). My personal favorite is the additional of the introductory paragraphs to both of the Official Declarations, which you can read here. You can read a summary of the changes here. Or view a side-by-side comparison of many of them here. I've spent the morning updating my print scriptures ('cuz I'm kind of a geek like that), but all of the changes will be (or already have been) automatically made on all the digital versions of the scriptures. Very, very cool. I remember trying to read The Secret Garden on someone's recommendation when I was a 5th grader. Talk about dialect! I don't think I actually managed to get through that book until I saw the movie as an adult. Even now, if I re-read it (and I do!) I prefer the audio version so I don't have to try to figure out what Dicken and Martha are saying.